Dr. Jinsong Liu is a structural biologist who has worked for over 10 years with biotechnology companies, research institution from the USA and China. He is an author of over 20 peer-reviewed journal articles and patents. Dr. Liu currently is a Principle Investigator and Head of Structural Biology Laboratory in Guangzhou Institutes of Biomedicine and Health (GIBH), Chinese Academy of Sciences. Before joining GIBH, he was a Senior Scientist at Amgen Inc. (San Francisco Site). Prior to that, he was a Scientist at Tularik Inc., a biotechnology company located at South San Francisco. While working at Tularik/Amgen, he participated in numerous drug discovery projects using structural biology as a tool for CADD (computer-aid drug discovery). Drug targets he has worked on include protein kinases, nuclear hormone receptors and various enzymes. Since he joined GIBH at the end of 2005, he has setup a structural biology laboratory and spearheaded several structural based drug discovery projects. Our research interests focus on the determination of crystal structures for macromolecules with biological significance using X-ray diffraction, and utilizing the structural information to understand the underlying molecular mechanisms of biological process and eventually guide the drug discovery. We have tested various computational algorithms for high throughput virtual screening in our group and have validated those algorithms for their feasibility and accuracy. Our team currently has the capacity to utilize several virtual compound libraries comprised of more than 40 million compounds. We have obtained several early hits for several drug targets including: ADAMTS5 (OA target), NS3 (Dengue virus target), Plm4 (malaria target) using these libraries. We recently setup a mini supercomputer platform in GIBH. The system has a total peak performance up to 1.2T flops, plus 192GB memory and 10TB storage. 1. 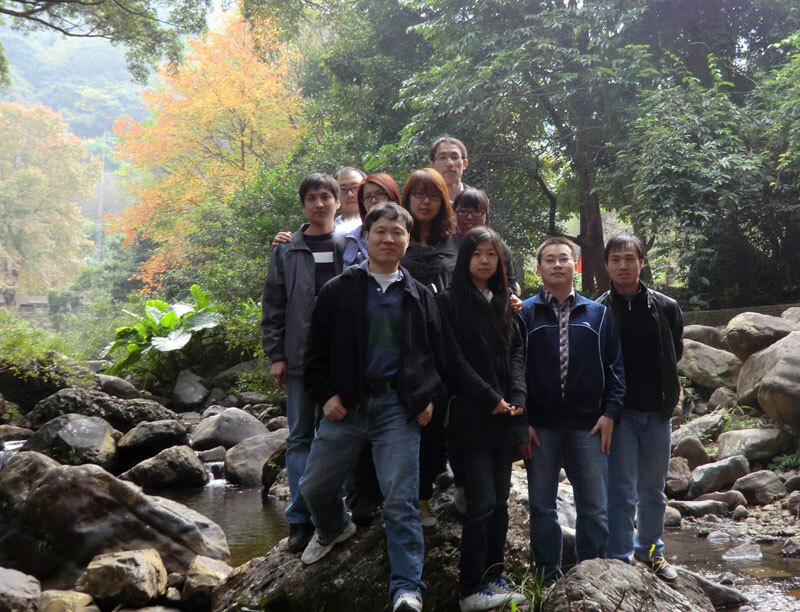 Zhang, Y., Xu, T., Chen, Q., Wang, B. and Liu, J. (2011) Expression, purification, and refolding of active human and mouse secreted group IIE phospholipase A2, Protein Expression and Purification (in press). 2. Lu, N.*, Wang, W.*, Liu, J.# and Wong, C. W.# (2011) Protein kinase C epsilon affects mitochondrial function in part through estrogen-related receptor alpha, Cellular Signalling 23,1473-2011. 3. Gao, M.*, Wang, J. *, Lu, N.*, Liu, J.# and Wong, C. W.# (2011) Mitogen-activated protein kinase kinases promote mitochondrial biogenesis and cell cycle progression in part through inducing peroxisome proliferator-activated receptor g coactivator-1b expression, BBA-Molecular Cell Research 1813,6,1239-1244. 4. Liu, S., Dong, J., Mei, G., Liu, G., Xu, W., Su, Z., and Liu, J. (2011) Crystallization and preliminary crystallographic studies of a cysteine protease inhibitor from the human nematode parasite Ascaris lumbricoides, Acta Crystallogr Sect F Struct Biol Cryst Commun 67, 228-230. 5. Liu, Q., Shen, Y., Liu, S., Weng, J., and Liu, J. (2011) Crystal Structure of E339K Mutated Human Glucokinase Reveals Changes in the ATP Binding Site, FEBS Letters 585(8),1175-1179. 6. Gong, L., Xiao, Y., Liu, Q., Li, S., Zhang, C., and Liu, J. (2011) Preliminary X-ray crystallographic analysis of the glycosyltransferase from a marine Streptomyces species, Acta Crystallogr Sect F Struct Biol Cryst Commun 67, 136-139. 7. Gao, M., Wang, J., Wang, W., Liu, J., and Wong, C. W. (2011) Phosphatidylinositol 3-kinase affects mitochondrial function in part through inducing peroxisome proliferator-activated receptor gamma coactivator-1beta expression, Br J Pharmacol 162, 1000-1008. 8. Zhang, W., Xu, J., Liu, F., Li, C., Jie, Y., Chen, S., Li, Z., Liu, J., Chen, L., and Zhou, G. (2010) Heterodimers of Histidine and Amantadine as Inhibitors for Wild Type and Mutant M2 Channels of Influenza A, Chinese Journal of Chemistry 28, 1417-1423. 9. Yan, X., Wang, Z., Sudom, A., Cardozo, M., DeGraffenreid, M., Di, Y., Fan, P., He, X., Jaen, J. C., Labelle, M., Liu, J., Ma, J., McMinn, D., Miao, S., Sun, D., Tang, L., Tu, H., Ursu, S., Walker, N., Ye, Q., and Powers, J. P. (2010) The synthesis and SAR of novel diarylsulfone 11[beta]-HSD1 inhibitors, Bioorganic & Medicinal Chemistry Letters 20, 7071-7075. 10. Zhou, J., Duan, L., Chen, H., Ren, X., Zhang, Z., Zhou, F., Liu, J., Pei, D., and Ding, K. (2009) Atovaquone derivatives as potent cytotoxic and apoptosis inducing agents, Bioorganic & Medicinal Chemistry Letters 19, 5091-5094. 11. Xu, W., Yi, L., Feng, Y., Chen, L., and Liu, J. (2009) Structural insight into the activation mechanism of human pancreatic prophospholipase A2, J Biol Chem 284, 16659-16666. 12. Motani, A., Wang, Z., Weiszmann, J., McGee, L. R., Lee, G., Liu, Q., Staunton, J., Fang, Z., Fuentes, H., Lindstrom, M., Liu, J., Biermann, D. H. T., Jaen, J., Walker, N. P. C., Learned, R. M., Chen, J.-L., and Li, Y. (2009) INT131: A Selective Modulator of PPAR[gamma], Journal of Molecular Biology 386, 1301-1311. 13. Connors, R. V., Wang, Z., Harrison, M., Zhang, A., Wanska, M., Hiscock, S., Fox, B., Dore, M., Labelle, M., Sudom, A., Johnstone, S., Liu, J., Walker, N. P., Chai, A., Siegler, K., Li, Y., and Coward, P. (2009) Identification of a PPARdelta agonist with partial agonistic activity on PPARgamma, Bioorg Med Chem Lett 19, 3550-3554. 14. Tu, H., Powers, J. P., Liu, J., Ursu, S., Sudom, A., Yan, X., Xu, H., Meininger, D., Degraffenreid, M., He, X., Jaen, J. C., Sun, D., Labelle, M., Yamamoto, H., Shan, B., Walker, N. P., and Wang, Z. (2008) Distinctive molecular inhibition mechanisms for selective inhibitors of human 11beta-hydroxysteroid dehydrogenase type 1, Bioorg Med Chem 16, 8922-8931. 15. Li, Y., Wang, Z., Furukawa, N., Escaron, P., Weiszmann, J., Lee, G., Lindstrom, M., Liu, J., Liu, X., Xu, H., Plotnikova, O., Prasad, V., Walker, N., Learned, R. M., and Chen, J. L. (2008) T2384, a novel antidiabetic agent with unique peroxisome proliferator-activated receptor gamma binding properties, J Biol Chem 283, 9168-9176. 16. Kopecky, D. J., Hao, X., Chen, Y., Fu, J., Jiao, X., Jaen, J. C., Cardozo, M. G., Liu, J., Wang, Z., Walker, N. P., Wesche, H., Li, S., Farrelly, E., Xiao, S. H., and Kayser, F. (2008) Identification and optimization of N3,N6-diaryl-1H-pyrazolo[3,4-d]pyrimidine-3,6-diamines as a novel class of ACK1 inhibitors, Bioorg Med Chem Lett 18, 6352-6356. 17. Julian, L. D., Wang, Z., Bostick, T., Caille, S., Choi, R., DeGraffenreid, M., Di, Y., He, X., Hungate, R. W., Jaen, J. C., Liu, J., Monshouwer, M., McMinn, D., Rew, Y., Sudom, A., Sun, D., Tu, H., Ursu, S., Walker, N., Yan, X., Ye, Q., and Powers, J. P. (2008) Discovery of novel, potent benzamide inhibitors of 11beta-hydroxysteroid dehydrogenase type 1 (11beta-HSD1) exhibiting oral activity in an enzyme inhibition ex vivo model, J Med Chem 51, 3953-3960. 18. Wang, Z., Liu, J., Sudom, A., Ayres, M., Li, S., Wesche, H., Powers, J. P., and Walker, N. P. (2006) Crystal Structures of IRAK-4 Kinase in Complex with Inhibitors: A Serine/Threonine Kinase with Tyrosine as a Gatekeeper, Structure 14, 1835-1844. 19. Bella, J., Liu, J., Kramer, R., Brodsky, B., and Berman, H. M. (2006) Conformational effects of gly-x-gly interruptions in the collagen triple helix, J Mol Biol 362, 298-311. 20. Wang, Z., Benoit, G., Liu, J., Prasad, S., Aarnisalo, P., Liu, X., Xu, H., Walker, N. P., and Perlmann, T. (2003) Structure and function of Nurr1 identifies a class of ligand-independent nuclear receptors, Nature 423, 555-560. 21. Benoff, B., Yang, H., Lawson, C. L., Parkinson, G., Liu, J., Blatter, E., Ebright, Y. W., Berman, H. M., and Ebright, R. H. (2002) Structural basis of transcription activation: the CAP-alpha CTD-DNA complex, Science 297, 1562-1566. 22. Liu, J., Lynch, P. A., Chien, C. Y., Montelione, G. T., Krug, R. M., and Berman, H. M. (1997) Crystal structure of the unique RNA-binding domain of the influenza virus NS1 protein, Nat Struct Biol 4, 896-899.